At JeepWorld we’re always searching for new and exciting Jeep Accessories to offer. Here are three of our favorites for the last quarter of 2013. All three we’re featuring here happen to be accessories for the Jeep Wrangler. Let us know what you think! The Sherpa Roof Rack by Rugged Ridge is a safari-style Jeep Rack that extends up and around your Wrangler’s hard or soft top. Using attachment points on the body of your Jeep, this rack requires no additional modifications to your vehicle. With a three hundred pound carrying capacity, this heavy duty rack provides plenty of function to go along with great off-road expedition looks. The best part of this new Jeep Rack is the price, coming in at $639.99 for the 2 Door Jeep Wrangler and $669.99 for the 4 Door Jeep Wrangler. Similar Racks on the market sell for $800 and up! Do you drive an all new 2014 Jeep Wrangler? With it’s first round of seasonal weather on the way, you’re going to want to keep your Jeep’s interior protected with a set of 2014 Jeep Wrangler Floor Mats. These mats come in black only, feature a unique tire tread pattern and the Jeep Logo, and are made by Mopar to specifically fit your Jeep Wrangler’s floors. This will allow for greater protection of your interior over time. We always have these floor mats in stock and can ship same day up until 2pm EST. The Harken Hoister fits perfectly within the JeepWorld family of products. 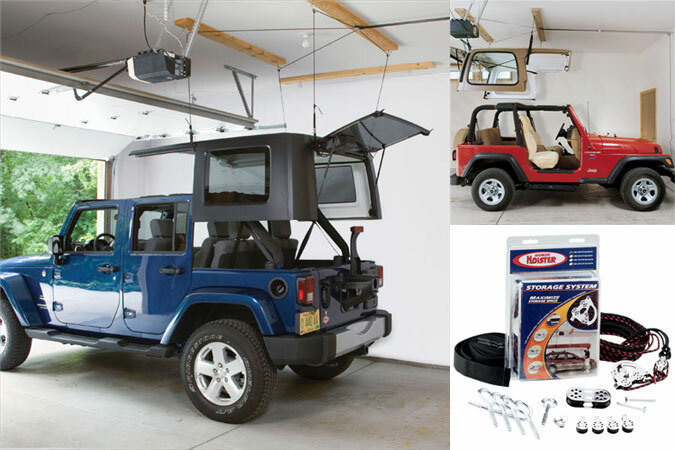 This Jeep Hard Top Hoist Kit is an easy and convenient way for you to get your top on and off relatively hassle free. No need to call your neighbor or friend to help you lift your hard top on and off, simply use this hard top hoist system. An easy solution for install and removal of a hard top and a great way to save space in your garage. Kit includes ropes, hooks, pulleys and hardware. Published on October 4, 2013. 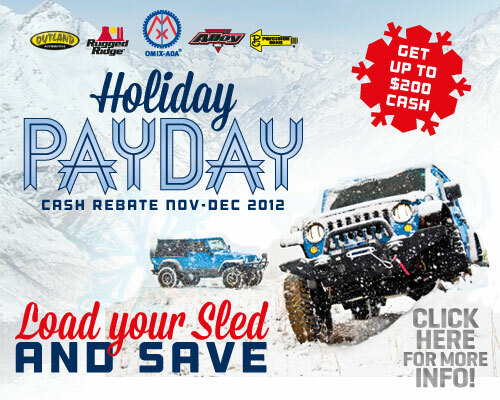 Rugged Ridge Holiday PayDay Rebate Program – get up to $200 cash back! Now through December 2012, JeepWorld.com is running the Rugged Ridge Holiday Rebate on all Rugged Ridge Jeep Accessories! Get up to $200 cash back when you order Rugged Ridge, Alloy USA, or Outland Automotive. The more you buy the more cash you get back! Click here to start your Holiday Jeep Shopping! If you’re using your Jeep like it’s meant to be, you’re getting plenty muddy and wet. The Rugged Ridge Modular XHD Jeep Snorkel System relocates the vulnerable stock air intake location to help reduce the risk of hydro-locking your Wrangler’s Engine and help prevent dust clogged filters. It is also the first Jeep Snorkel designed with the modular functionality of a pre-filter low mount & ram high mount air intake engineering. Unlike other snorkels, you don’t have to give up flexibility for functionality. Built in manual drain valves channel away excess water to prevent it from entering the intake system. It installs with minor modification to the fender, but without the major cutting and surgery that other kits require. So there it is JK drivers! Enjoy! Be sure and take advantage of the current “Holiday PayDay Cash Rebate Program” offered on all Rugged Ridge Jeep Accessories. Earn up to $200 cash back now through December 2011. Products include; floor liners, winches, bumpers and tops. Don’t miss out on this one! 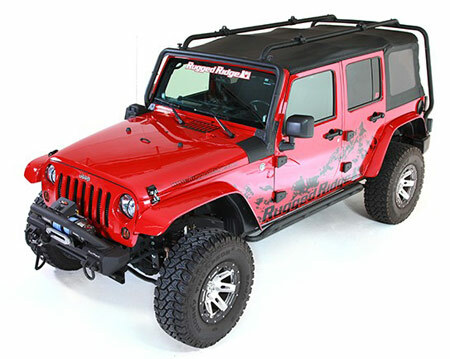 All Rugged Ridge Jeep Accessories are currently available at JeepWorld.com! Just wanted to give you all a little inside info on our latest Coupon Code! Hook your Dad (or yourself) and his (or your) Jeep up with some sweet Jeeps Accessories, Apparel, and Merchandise and get 10% off your entire order. Just enter the code: “JEEPDAD” into the shopping cart when checking out and you’re good to go! Dads are some of the hardest people to buy for, so if the Dad in your life loves Jeep like we do, you’ll want to check out these awesome Jeep gift ideas for Dads. Happy Father’s Day, Jeep Dads! 1. Jeep Hats – We carry every possible hat a Jeeper could want. From the conservative Jeep Original Patch Cap to the Jeep Camo Trucker Hat, we’ve got that special Dad’s taste (and head) covered! 2. Jeep Grab Handles are an great gift for Wrangler Drivers. Available in several designs and an array of colors, Wrangler Grab Handles offer a hand when getting in and out of the vehicle or something to hold on to when the Jeep gets back to it’s natural habitat. 3. We offer several ways to organize cargo while on the road including the Jeep Cargo Tote and a number of Thule Car Organizers; including a few Jeep Trunk Organizers , a Visor Organizer , and a Car Trash Bag. All make great gifts! 4. Jeep Tents are an easy way to enhance the Jeep Lifestyle and a great gift for any Jeep-driving outdoorsman. Just drive up and pitch the tent and you’re good to go! Tents attach to the rear of all Jeep models. 5. Dress up that Jeep Wrangler or older model Jeep Liberty with one of our many Jeep Tire Cover options. We carry something for everyone! 6. You can’t go wrong with one of these cool Jeep Key Tags to go with that cool Jeep! Many different styles and color options are available. 7. Another easy gift, the Jeep Visor Clip comes in blue or green with the Jeep logo and holds sunglasses and other small accessories on your Jeep’s Visor. 8. Got a Dad who loves to Off-Road? He’ll need this all-inclusive Jeep Off-Road Recovery Kit to assist in his 4×4 adventures. Hook a Dad up! 9. He’d probably like the Jeep Recovery Shovel too, so throw one of these in. It’s a heavy-duty shovel, while still folding up for easy storage. 10. Any Jeep Dad worth a salt is going to go through Jeep Floor Mats like they’re going out of style. Available for the Wrangler, Liberty, Commander, Grand Cherokee, Patriot, Compass, and Cherokee! This Week’s Featured Jeep is brought to you by JeepWorld! We’re your online source for Jeep Accessories, Parts, and Apparel. From Jeep Wrangler Floor Mats and Jeep Bike Racks to Thule Kayak Racks and Rugged Ridge Winches we’ve got everything you need to raise the fun factor of your Jeep (as if it wasn’t a blast already)! We offer the best in Jeep Seat Covers, Grab Handles, and Jeep Wrangler Bumpers. Check us out! 2015 Moab Easter Safari Concept Vehicle Sneak Peak! Life is Good Jeep Tire Covers. All-new designs!